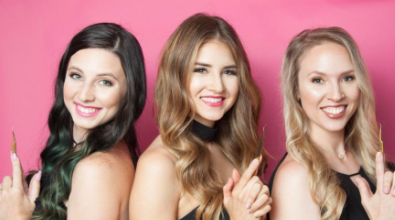 Owner of Pink Lady Lash in Austin, TX, with one location and another one on the way, Shelby offers classic and volume eyelash extensions, eyelash perms and tinting, and microblading eyebrows. Shelby is also a certified Lash Affair Trainer who teaches classic and volume lash application to students in Texas. We got to talk with this busy boss lady about her love of lashes and how she has gained success in this industry. She was glad to share her experiences in hopes it would guide you in your own lash journey! Where do you work? I own Pink Lady Lash. We have one location in Austin and one in Cedar Park, which opens in a few weeks! How long have you been lashing? I dabbled in 2011 but got serious about it in 2013. What certifications do you have? In addition to a Bachelor's Degree in Sociology, I am an esthetician and am certified in classic lash extension application from JB Lashes and certified in volume lash application from Borboleta. As well, Lash Affair has certified me as a trainer for both classic and volume lash application. I was raised in Austin, Tx and come from a large family. As a middle child, I had a lot of amazing people to look up to in my family and loved being able to influence my younger siblings too. My parents are complete opposites, and I think that's what helped mold me into the type of lash artist and business owner I am today. My dad taught me about hard work, dedication, and progression. My mom taught me to lead with my heart and to have compassion. I appreciate both of them for supporting me in the ways that I needed to be successful. I will still call both of them for advice, each for different subjects, to this day. I was an entrepreneur at a young age; always planning my next gig, whether it was coordinating clubs within my neighborhood or running a lemonade stand. I've always had a knack for building systems and enjoy problem-solving, but I also really enjoy getting my hands dirty. Arts and crafts was a passion of mine while growing up. I would build miniatures out of clay, Play-Doh, and paper, so it makes sense that I'd be doing such tedious, detailed work later in life. During my school years, I participated in cheerleading, dance, and track. Nowadays, you'll typically find me with my family or furbabies on my off time. I've always been obsessed with lashes, not necessarily false lashes, but I've noticed other people's natural lashes since I was young; before eyelash extensions were even popular. When I was in college, I did bridal makeup to support myself and became enamored by the beauty industry. I'd spend hours watching YouTube tutorials and reading up on different brands, researching their ingredients, rather than studying for my tests. I attempted to go to beauty school halfway through my sophomore year, but that didn't last long since I was still taking college courses full time. I needed to finish my degree, but I knew I was going to own an eyelash extension salon one day, and that I would come back to beauty school once I graduated. During my last year and a half of college, I would spend most of my lecture hall hours writing my salon ideas in a pink glittery notebook (which I still treasure.) I graduated with a degree in sociology, barely. The next day, I was sitting in the beauty school classroom. Once I was in beauty school, I focused on lashes above all else. I like artists who specialize in one thing, and I knew that eyelashes would be my thing. Even though my heart is in the beauty field, I'm happy to have gotten my degree in sociology because I end up using a lot of lessons from sociology in my lash career, so that worked out! How do you feel about owning a studio? Owning a salon is a lot harder than I thought it was going to be. Most days I am the first one there and the last one to leave, and it never slows down. There has been a lot of stressful times but when I remind myself of the reason I am doing this, it puts things into perspective and makes things a bit easier. I'm blessed to have such a fantastic team and miss them when we aren't at work. My favorite thing is getting to see the impact that my team makes on our clients and seeing my team happy. I still get emotional sometimes when I sit back and think about it all. Having your heart so attached to your workplace and your work can be good and bad at times though. I've learned a lot over the last year since I expanded to my first storefront, and I know we've got a lot more ahead! It's exciting. Always something new to tackle. Shelby stands proudly outside her studio. Her drive and passion have put her and her team on the lash map of Austin! Can you expand on something you've learned that might help someone looking to start their own business? Since starting my own business, I have learned that the word success means different things to different people. YOU define what success is for YOU. I can tell you that working by yourself or for yourself does not guarantee success. The clients don't just line up at your door. It takes an incredible amount of work and you've got to prepare for anything. Even if you have the right values, a positive mindset, and have a hundred certifications, you're still going to run into problems. BUT if you work every day towards your version of success, it will happen! Whether you work alone or with a team, you can be successful! To me, success means being genuinely HAPPY every single day. I worked so hard, day after day, to build Pink Lady Lash into a family that nurtures and protects those within it. I've learned that my version of success isn't measured by how many clients I can do in a day, but by the impact that I am making on my clients and my team. I try my best to make everyone happy and that gets exhausting, but I have learned that it's impossible to please everyone, even if you have good intentions. The best thing I can tell someone in this industry is never to stop learning. Have high standards and stand behind them. You will always have clients requesting things that may go against your values. A client may request lengths or thicknesses that their natural lash cannot handle. Stick to your gut and always do what is right, and the right clients will appreciate your integrity and will stick with you. Our industry needs more artists who know when to say "no," and when to educate a client on preserving the health of the natural lash. Having these standards has helped Pink Lady Lash build a family of clients who trust us and are loyal because we have proven to care about them and their natural lashes. Started in 2014, Pink Lady Lash continues to grow, with it's second location opening up in Cedar Park, TX in a few weeks. What moved you to choose Lash Affair? Jenelle and Paul Paris, the founders, have such an incredible vision and lead with their hearts, like me. I use Lash Affair products in my workspace, but it's a company that stands for a lot more than just great lashes. They are all about elevating others, connecting with people, and radiating positivity. That's the type of company where I belong! What’s your favorite Lash Affair product? The Double Date Tweezers, hands down! Shelby and her team are fighting the good fight, armed with Lash Affair tweezers in hand! What advice would you give a new lash artist? Practice makes perfect! Don't compare yourself to others, and know that there is room for all of us to shine in unique ways. Know your foundations and repeat them until it becomes muscle memory. What is your favorite thing about being a lash artist? Getting to see my work come to life! It's rewarding to be talking to a friend or client who is wearing your work and seeing how the lashes brighten their face and watch their confidence boost once they have them. I get to connect with a lot of women and have made so many life-long friends out of being a lash artist. It's not just about the lashes. What the best way you’ve found to attain and retain your clients? Referrals! A reference is great because your clients are doing the talking. They are giving a first-hand experience of why their friends should pick you. When that person comes to you, you both already have a friend in common, and they are more likely to trust you and connect with you. When someone comes in from a deal or ad, they tend to not connect with you as easily. It's more about the price for them than the experience or value. What do you believe is your role or mission in this industry? I know that my mission is to mold and guide lash artists to their highest potential. I see a lot of students get down on themselves, but I'm like, "Wow they have no idea how much better they are than I was when I first started!" It's my job to give them that confidence that will push them farther. I still keep in touch with most of my students who enjoy my mentorship, and I love being that person for them. As for my staff, I'm always pushing them to be better as well. My team is great, but it doesn't stop us from aiming higher everyday. What sets you apart from other lash artists? I still enjoy learning. Not just in lashing but growing as a person and soaking up new experiences is fascinating to me. I let go of trying to be the best because it leads to a lot of strain and stress. I start with loving what I'm doing at any given moment and focusing my attention on positivity. It makes my work better and more fulfilling, so naturally, I'm becoming better, but also happier, in the process. I set my intention towards my work, and I swear my eyelash retention is better from it. When my intention is set that I'm going to create a perfect bond between the natural lash and extension, my mind is geared towards doing so. I notice how well I rinsed the lashes when cleansing, exactly where I placed my lash, how fast the adhesive is drying, the slightest change in consistency in my adhesive drop, etc. Just changing my intention, in general, sets me up to do better work and makes me a happier lash artist and able to give more positive energy towards my clients and staff. I want to continue leading the Pink Lady Lash team here at home. We are about to open another location, and it keeps me very busy! My team has great vision and shares the same passion that I do. I get emotional talking about them because I am so proud and we all truly love what we do. A lot of artists work alone and build their own name. Pink Lady Lash is about all of us, so I have to be here with my team, leading and loving them through all of the ups and downs that we share together! I will also, of course, be teaching my Lash Affair classes year round and you will be seeing me at a lot of trade shows and conventions this year. Is there anything else you would like to know about Pink Lady Lash or Shelby? Follow her on Instagram @pinkladylash for the latest updates and email her at shelby@lashaffair.com for training questions or anything else you may want to know. Leave a shout out to Shelby and her team in a comment below!